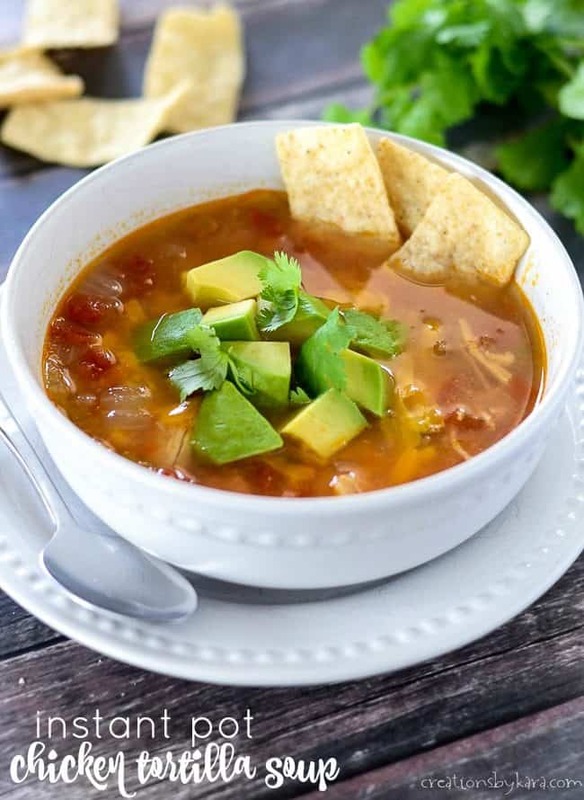 Instant Pot Chicken Tortilla Soup . 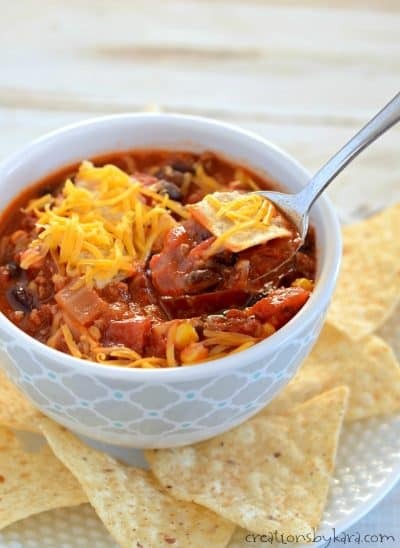 . . loaded with tasty ingredients, this Mexican soup is full of flavor! It is so easy that my teenage sons make it on a regular basis. 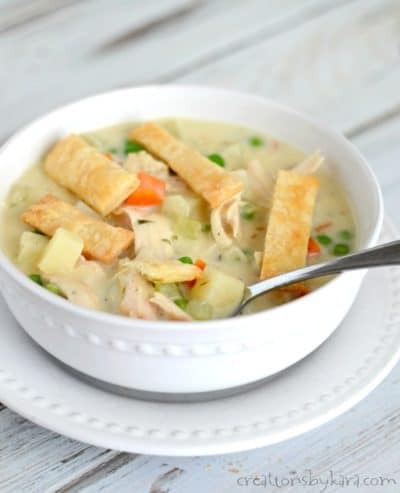 We love serving soups like this with cornbread, artisan bread, and garlic cheese twists. 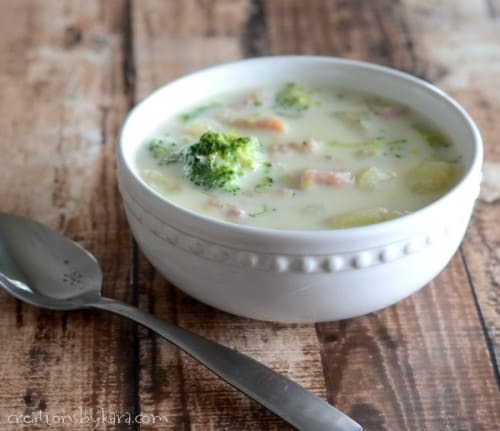 I first tried this soup last fall, and it has been a family favorite ever since. 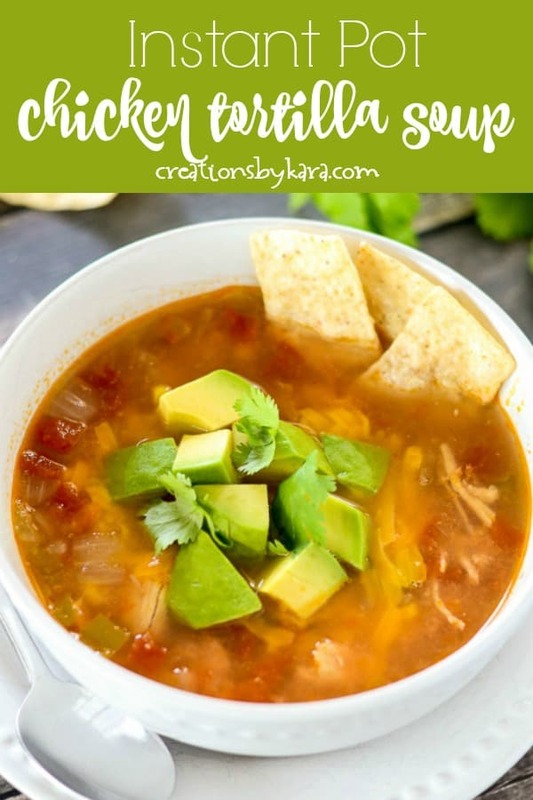 It is similar to my traditional tortilla soup recipe, but it is even more simple to make. You just toss everything in the Instant Pot and walk away! I’m pretty new to using the Instant Pot, but this is one recipe that turns out perfectly every time. My boys have made it several times, and it comes out perfectly every time. It is healthy and delicious, and the entire family loves it! 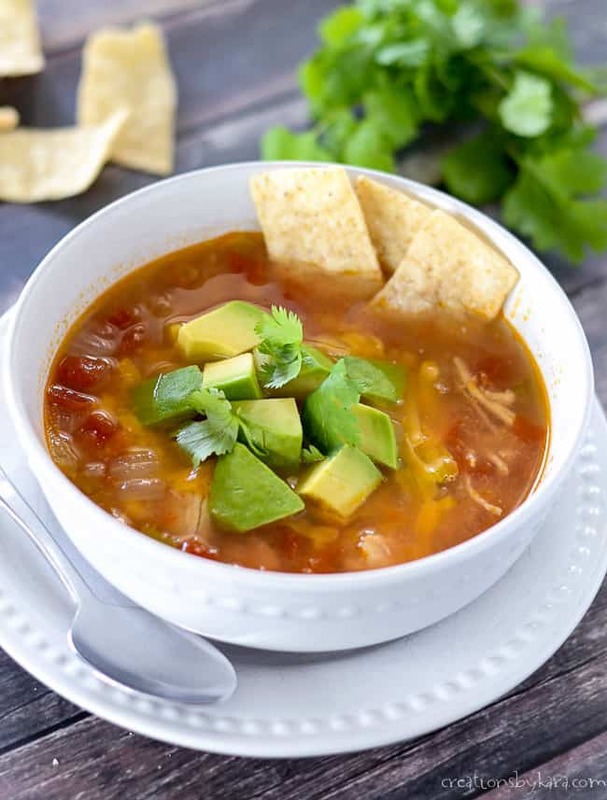 Can I use frozen chicken in my Instant Pot Chicken Tortilla Soup? -Yes, you can use frozen chicken breasts. I’ve made it with frozen chicken a couple of times and it still turns out perfectly. Can I use chicken thighs instead of chicken breasts? -I prefer white meat, so I haven’t tried using thighs, but I’m sure they would work. This soup could not be more simple, and you won’t believe how good it tastes! You just slice a few vegetables, then dump all of the ingredients into the pot. After you close the steam valve, set the Instant Pot to high for 25 minutes. It will take about 10 minutes to come up to pressure, then it will start counting down. When it beeps, use a long spatula or wooden spoon to open the steam valve and release the pressure. Extra garnishes are what makes this soup over the top delicious, so don’t leave those out. My favorite are the diced avocados. So delicious! 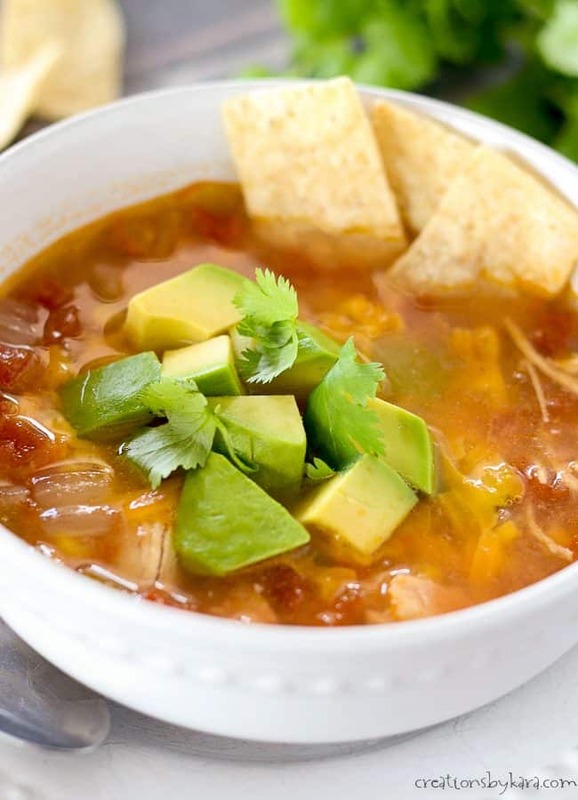 Mexican Chicken Tortilla soup is hearty and delicious. It takes only 5 minutes to prepare! Combine all ingredients in an Instant Pot with the chicken on the bottom. Make sure steam release valve is closed. Manually set to HIGH for 25 minutes. Use a long spatula to open the steam release valve and let out all steam. Shred the chicken and stir the soup. 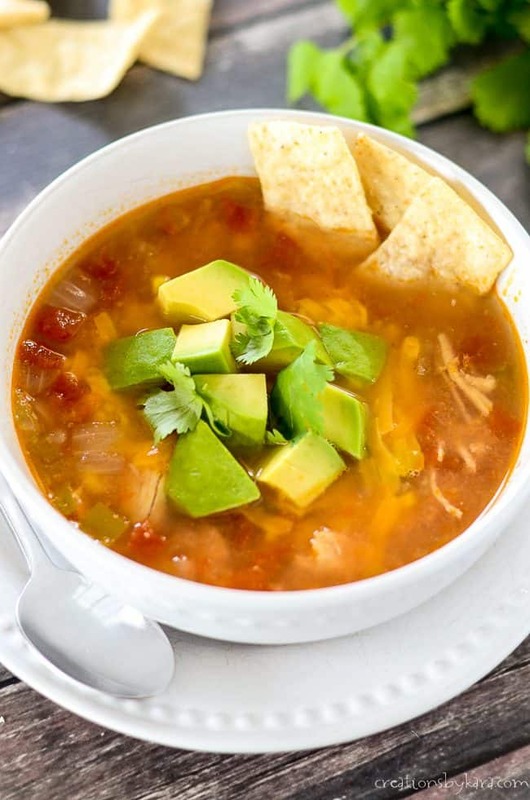 Serve soup hot with avocados, shredded cheese, and tortilla chips. 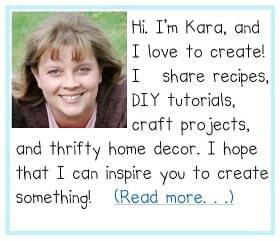 Love finding new recipes for the instant pot!! Can’t wait to try this one. I love that there are so few ingredients! I may make these. I love Chicken Tortilla Soup! Can’t wait to try it in my Instant Pot! I’m definitely new to using my Instant Pot too – looking forward to trying this and warming up this winter with some hot soup! It is definitely one of my favorite ways to warm up after a chilly day! Thanks for the tip that you can use frozen chicken breasts- that made it so fast and easy. Love all the flavors too!